Life insurance is pretty simple, right? You buy a policy. And when you die (yep, we said it), the people you named as beneficiaries get the benefit.1 But you have to make a few decisions so you can get the policy that’s right for you. Take our quiz to find what policy works for you. 1. Are you the kind of person who loves the risk element when it comes to money? I don’t mind risk. But of course I hope for strong returns. I play it pretty safe with what I earn, if I can. Sometimes. Depends on the situation. 2. When you think about future money needs for you or your family in case of emergency, is there a specific period of time that you’re particularly worried about? Not necessarily. I want something that’ll be there whenever we need it, period. I particularly worry about something happening to me when my kids are young. I’m not sure what I’d want. That’s tough to think about. 3. What’s your financial situation right now? I’m in a good place. I can afford to make some moves to protect what I have and love. Not great. So I worry about what would happen to others if I wasn’t around. I’m in a decent place but concerned about both the long- and short-run, when it comes to protecting my family. 4. Do a lot of people depend on you? Yes, and I’d like to plan to take care of them if something happens to me. They do now. But that’s just my current life stage. Yes, but I’m not sure what to do about that financially in case something happens to me. 5. What type of saver are you? I like to set it and forget it. Payroll, autopay, retirement savings—I like to automate those types of things. I’ll put money away when I have it—and spend it if I need it. I do a mix of things—savings, investing, piggy bank, you name it. You should consider permanent life insurance. The key is in the name: this is a permanent policy that is yours for as long as you live (assuming you keep paying the premiums, of course). It also lets you build cash value—which means you can borrow against it, use it to pay policy premiums, or pass it along to your heirs2. In exchange for the cash value, you’ll pay more for the policy. Ask your financial advisor about how much you’ll need, for the loved ones you leave behind. Then you might look into term life insurance that lasts for a certain period of time—usually ranging from one year to 30 years. Term insurance doesn’t include a cash value option. But it is less expensive than permanent life insurance. You might be interested in aspects of both permanent and term life insurance. Lots of people choose coverage with both because it helps cover you through specific time periods (when your kids are little, extended travels, things like that). See the example below. 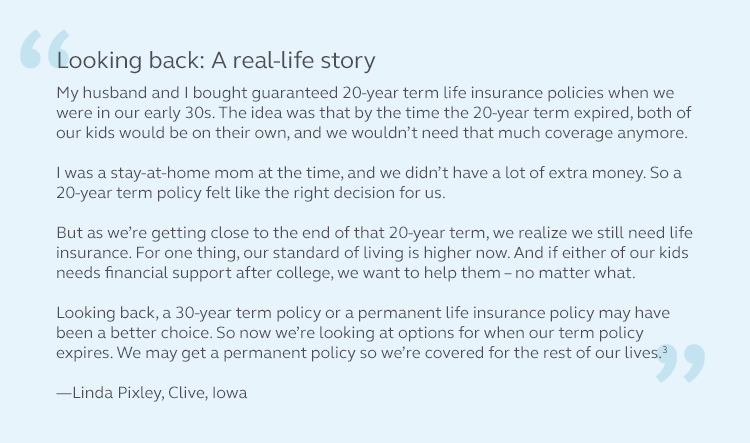 Whatever type of life insurance you get, buying sooner rather than later is key. Rates are based on life expectancy, so the younger you are when you buy, the less you’ll usually pay. Permanent life insurance: What type is right for you? Get a handle on your life insurance options—with our step-by-step life insurance guide (PDF). 1 In exchange for the death benefit, life insurance products charge fees such as mortality and expense risk charges and surrender fees. 2 The death benefit paid to your beneficiary is reduced by any partial withdrawals, policy loans or accelerated benefits taken. Surrender charges and other policy charges may apply to distributions taken from the policy. 3 This is not a paid advertisement. The customer is not affiliated with any company of the Principal Financial Group®, and the views expressed are her own.